Marble bathrooms are breathtaking. Its sophistication crawls in the space, whether you use it to adorn your bath’s floor, walls, and ceiling. That’s why a lot of homeowners still dream of having one. If your budget allows, you should push for this investment. The good news? Marble tiles are not just for the rich and powerful anymore. It already made its way into our everyday homes. The problem? Marble takes a hundred to a thousand years before it’s formed. There’s only a finite amount of marble that can be quarried on Earth. Commercialising it only makes it harder to find high-quality marble for home design projects. Worse, some homeowners might be provided with cheap yet poor quality stone tiles. This makes marble special. A marble piece is unique from other pieces of marble that’s quarried on the same place. That being said, you don’t have to worry about the uniformity of the marble tiles you’re buying. Instead, look at its veining and colours. If it has an even colour palette and soft vein, it’s a great purchase. Additional tip: There are two types of marble tiles based on the veining—the Calacatta and Carrara. People normally mix them up because there’s a thin difference between the two. Calacatta tiles are whiter with bold and noticeable veining while Carrara tiles are greyer with softer veining. You should also know that Carrara is more common compared to Calacatta. The latter is considered as a precious stone and costs more. Marble is a soft stone—it can be milled, machined, and tumbled. It can be used and cut in numerous ways. For your bathroom, you can use large slabs for your wall and floor. You can use smaller tiles for your vanity and corner designs. 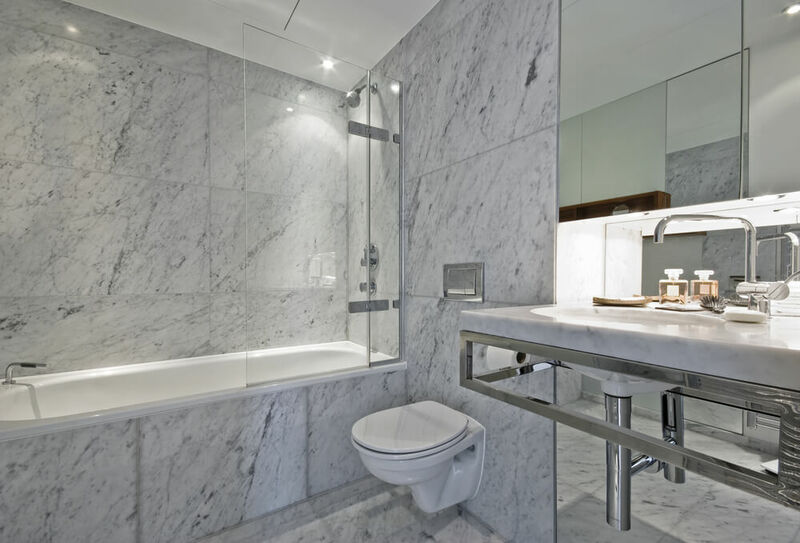 Marble bathrooms are beautiful, but it’s a challenge to keep it that way. First of, marble is very absorbent, meaning you have to very careful not to stain it. It’s a no-no to dye your hair in the bathroom. The stains are gonna stay there forever. Marble is also easily etched when you expose it to acidic cleansers. You can’t use strong cleansers because that will ruin the look of the tiles. Before buying a set of marble tiles for your bathroom, test a sample of it with your chosen cleanser. Look at how your cleanser reacts and change it if necessary. Most importantly, use the right sealant and never miss maintenance. If you’re purchasing tiles from another country, you have to be very keen and careful. Most of the high-quality tiles come from Italy, Turkey, Brazil, India, China, Afghanistan, Canada or the US and it takes a long time before it reaches Australia. Who knows what can happen to the tiles inside a cargo ship that’s sailing in the sea for months? It might arrive broken or with chipped corners and edges. It might not possess the smooth square cut that you expected it to be. To avoid these unfortunate results, you have to purchase from a reliable stone tile company. Someone whom you can trust to pack the tiles properly so it’s not damaged on their way to you. We mentioned how soft and porous marble can be, which is why you have to be careful not to stain and engrave it. Adults can easily understand the things that can harm the tiles, but small children? We don’t think so. 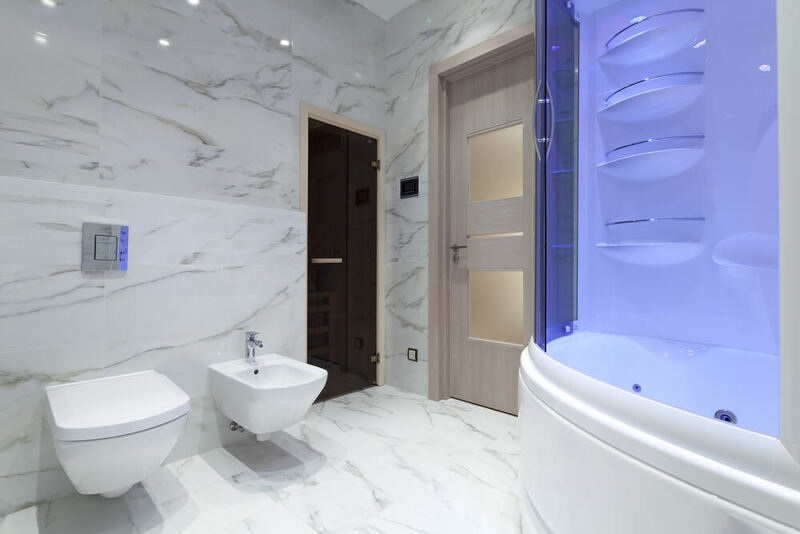 It’s either you wait for the kids to grow or attach your marble bathroom to your bedroom. An en suite will reduce the dangers of ruining the marble tiles. You should know that marble stone contains a lot of minerals, including iron. As we all know, iron forms into rust when it reacts to oxygen. The rust will give the marble tiles a reddish-brown stain. It can be a little disappointing, especially when you’re opting for clean and crisp white bathrooms. You can prevent it by using the highest quality sealant you can find. We hope these tips helped you decide whether to go for marble bathrooms or not. If you have any thoughts or if you’d like us to help you design an awesome bathroom, don’t hesitate to contact us.